vanilla & lace: there's a baby coming! A baby was always in our "five year plan" (although it would've been in my 1 year plan had it just been my decision) so as 2013 approached we started to have lots of conversations. Is there anything we want to do first? Do we make enough money? Do we have good health insurance? And more specific things like what kind of schooling our kids will do and how they will be disciplined or will they be vegetarian..... so much to think about! There was also many many talks with a ton of our good friends about what to expect, ect and finally at the beginning of the year we we're like Lets do this!! The first couple months were a tad hard for me, as periods came and went, I did LOTS of praying and even more trusting. Then I realized that maybe the iphone app we were using to know when i ovulate was off, so I got some ovulation tests and went to town. Turns out my body likes to be really different and I ovulated like 10 days before the app predicted... so we had completely missed it! Just a heads up for people who use that app as a means of birth control or conceiving: not a good idea! All that to say, I know a couple months isn't a long time to wait (some people wait years and years) but I was so happy to see those double pink lines... so happy i took 12 pregnancy tests! The first trimester was a little rough, nauseous 24/7.. no appetite.. and sleeping all day, but it TOTALLY could've been worse so I'm counting my blessings. P.S. why does NO ONE ever talk about first trimester fatigue?? I really could've used some warnings on that one. I've never slept so much and still been so fatigue in my life. Which is why my store was closed for so long, by the way. Josh came home from work many nights and I was already in bed. Thank goodness he's so gracious and fed himself dinner the past couple months. Luckily I'm slowly getting my appetite back! Woo hoo! We've seen the little babe on an ultrasound and heard its heart beat... talk about exciting and surreal. There's a human in there! So incredibly thankful and excited for this new journey! This is so exciting! I'm so happy for you guys! I'll definitely be praying for a healthy little babe and healthy momma! :) Congrats! I am so excited for you and Josh! I'm praying for you and your baby as you begin this new journey of parenthood. Congratulations! You are an adorable mama! Congratulations! And you look adorable! SO SO SO excited and happy for you guys!!! !!!!!!!!!!! Congratulations!!!! Best, best wishes to all three of you :)! I'm so happy about this!! Congratulations! Your bump is so tiny & cute! Congrats! Congrats on your pregnancy! I'm starting to feel so curious about it. Soon. Hopefully :p.
All the best vibes your way ;D! Yay!!! So excited for you! I am having my first little baby in September and so I know how exciting this is! My baby girl has been making me exhausted and sick for the past 24 weeks, 24/7...I can totally relate to those yucky feelings. I would love to see updates on your pregnancy and wonder when you are due?? Again, Congrats! Congratulations! Oh what joy a newborn baby is! You look lovely by the way! I guessed as much when you mentioned the Dr.'s orders for more protein in your last post and all the talk of vitamins. :-) Congratulations! Amazing!! Such wonderful news! You look stunning. Congratulations! You look wonderful, so nice to see the bump. I have a friend who is pregnant and she is always tired too but she just adjusted to it. Whatever decisions you make I'm sure it will be the right choice. I saw this on instagram last week, and I am just so excited for you! I am SO glad you mentioned that about the app, because my husband and I have been trying for 6 months, and with each new cycle that comes, it's hard to be trusting, and not think negatively. Especially when it seems like every week another couple is announcing pregnancy! ha. It's like an epidemic or something. We do keep trusting and praying though! I will be buying some of those kits asap! congrats gorgeous! That's sooo excitiing! Very true about the fatigue, with my first I was working as a bank teller and I fell asleep standing up once plus I would sleep every lunch away. With my second I was at home and I used to lock both of us in her room and sleep on her floor while she climbed all over me and played around me. It is rough growing a human! Congrats! I slept almost 24 hours a day during my first trimester as well! It actually was the first thing that clued me in to something being up, as my husband and I weren't specifically trying at that point. Enjoy! congrats! that is so exciting. so happy for you two! Congratulations! 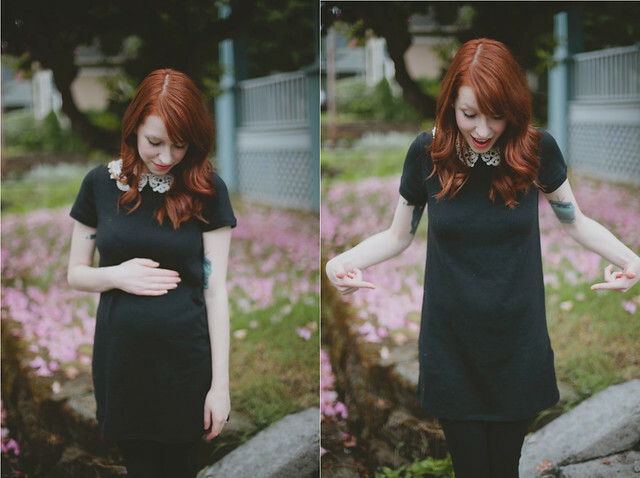 You are going to be the most adorable little mother. I can't wait to be in your position! yaaaay!! congratulations!! you'll be wonderful parents! SO VERY EXCITING. This bb will be the luckiest and prettiest of Portland bbz. Hi Abi, it's Annie from Brazil! Wow, it's going to be even more great to follow your blog now! With baby's ideas/thoughts/stuff! :) Loved it! Ha! I'm ten weeks now and I couldn't believe how tired I've been. Also, the roller coaster of no appetite to wanting to eat every 20 minutes. I'm all over the place. It's always nice to hear you're not alone. Congratulations and I look forward to reading about all things baby. My mom seriously took over a year to get pregnant with my sister. So she went off the pill earlier with me, expecting the same... not the case haah! I was an eager beaver apparently and she was pregnant pretty much right away. YYAAYY!! I am so happy for you and your hubby! A baby was in our "1 year" plan and I became pregnant with our first baby 2 months post-wedding haha I am now 27 weeks pregnant with a baby girl! People kept asking if our baby was "planned", I said of course our sweet miracle was planned! They thought we were crazy for wanting a baby so soon after marriage...but I know that I married my soul mate so there blessings being shined on us left and right! The first 3 months were seriously horrible though, it's amazing how much people don't talk about it. I felt so guilty for feeling so bad, so sick, so many food aversions, etc...you are definitely NOT alone. The amazing thing is that it WILL get better, 13 weeks is usually around the magic week where you start feeling like yourself again. God bless you, your husband, and your sweet miracle! EEEEE I'm so happy for y'all, it makes my heart burst with joy! Awww congrats! You are going to make a beautiful baby and mama! Congratulations. How exciting for you and your husband. Congratulations! 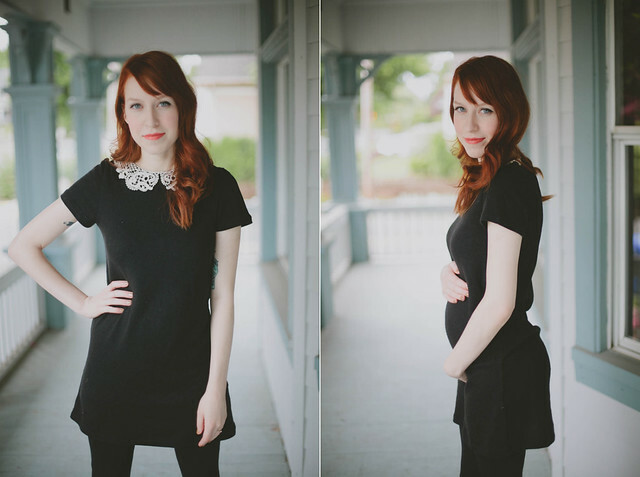 I have been checking your blog for a year now and I love it -- and now I felt like I should get myself together and actually leave a comment :) And you have the cutest little baby-bump - I have to say. I hope the rest of your pregnancy will be really wonderful. Oh you are soo cute! Congratulations to both of you! You definitely deserve it! :-) I'm so excited and happy for you! Lots of hugs & love! I know absolutely nothing about being pregnant so I love hearing about the journey couples go through to conceive. Eventually I'll have kids but in the meantime it is so refreshing to hear how it doesn't happen as fast as many people think it does. Congratulations and I hope you have a wonderful pregnancy! oh my goodness...I'm just now catching up on your blog...CONGRATS!! you look stunning already.